As Indian PM Modi readies for a Bangladesh visit, what will be on the agenda? Indian Prime Minister Narendra Modi, who has notably emphasized India’s ties with its neighbors, will be making a two-day visit to Bangladesh this weekend. India’s relations with Bangladesh have certainly witnessed a significant upswing over the past decade, some persistent challenges notwithstanding. Bilateral trade has risen to $7 million. Bangladeshi Prime Minister Sheikh Hasina has been cracking down on a hardline elements, and has provided India with logistical assistance, for instance in setting up the Paltana plant in Tripura. In 2012, Hasina was invited to Tripura, where she received an honorary doctorate from the University of Tripura. When Modi opened a second plant in December 2014, Hasina’s energy advisor Tawfiq-e-Elahi Chowdhury was in attendance. Modi agreed to a request from Chowdhury and Tripura Chief Minister Manik Sarkar for India to sell 100 MW of power to Bangladesh. This is not to say that the relationship has been without challenges. In fact there have been a number of setbacks. The Teesta river water treaty had to be scuttled at the last minute in 2011, due to pressure from Mamata Banerjee, the West Bengal chief minister who has agreed to accompany Modi this weekend but did back out at the last moment from former Prime Minister Manmohan Singh’s entourage in September 2011, as a protest against the Teesta agreement. Similarly, the India-Bangladesh Land Boundary Agreement, passed by Indian Parliament on May 7, has had its share of hurdles, due to opposition from political parties including Modi’s own BJP when Congress was in power. Interestingly, when the land bill was passed, External Affairs Minister Sushma Swaraj recognized the contribution of the Singh government. Modi also thanked opposition leaders for their support. Still, it is encouraging to see that while Modi’s election campaign included some avoidable rhetoric on Bangladesh, since taking office his approach to Dhaka has been altogether more cooperative. When he met Hasina on the sidelines of the UN General Assembly, Modi assured her that he would ensure passage of the land bill. The main items on the agenda during this weekend’s visit will be the signing of the land boundary agreement, and enhancing connectivity and business links – an issue that has been a priority for Modi. The Indian prime minister is in fact likely to travel via the land route to inspect the Petrapole post, and is also likely to flag off the Kolkata-Dhaka-Agartala bus service – other bus services like Dhaka-Guwahati may be announced during the visit. Modi and his Bangladeshi counterpart are also set to inaugurate a border haat (market) at Kamalasagar ,Tripura. India is also expected to agree to Dhaka’s request of increase the line of credit for projects aimed at enhancing regional connectivity, from $1.5 billion to $2 billion. In addition, Modi may announce a visa-on-arrival program for Bangladeshi tourists who travel by air. The Teesta treaty has likely been placed on the backburner. Modi has been trying to build consensus with Banerjee, the West Bengal chief minister, but progress has not been forthcoming, and this is unlikely to change until after the West Bengal Assembly elections. The India-Bangladesh relationship does carry strong historical and cultural overtones, but both sides also realize the immense benefits of a strong relationship. While Dhaka does have some grudges against New Delhi, some legitimate, it has not defined its national identity merely in terms of being anti-India, nor has it neglected historical and cultural commonalities. Significantly, Bangladesh has not been excessively dependent on any one country – ensuring that it maintains a degree of autonomy in its foreign policy – unlike some of India’s other neighbors. Of late, however, it has been seen to be inching closer to China. Bangladesh is also home to an aspirational middle class that would like to reap the dividends of a better relationship with New Delhi. Over the past decade the country has enjoyed steady economic growth, at an average annual clip of around 6 percent. This growth has of course benefited from international assistance and external factors, but it also owes to progressive policies and a vibrant civil society, as well as strong intellectual capital. The other point that will strengthen the relationship is the fact that both countries are keen to enhance connectivity not just between them, but also with other countries in South Asia. The BBIN (Bangladesh, Bhutan, India and Bhutan) corridor will be high on the agenda during the Modi visit. Apart from the SAARC region, Bangladesh is an important conduit for India’s Act East Policy, and there have even been some proposals of a strong trilateral between India-Bangladesh and Myanmar, such as a gas pipeline (although the current security situation may not permit it). Both countries are also part of a number of groupings that seek to expand South Asia’s connectivity with Southeast Asia and China; these include the Mekong Ganga Cooperation Initiative, BIMSTEC, and the BCIM (Bangladesh-China-India-Myanmar) economic corridor project. Modi has exhibited an ability to think out of the box. While it is likely that he will use some smattering of Bengali to bowl over his hosts, he needs to do much more and explore innovative modes of engagement. This requires looking at the relationship beyond simply a bilateral perspective, or even through a SAARC lens. For instance, apart from building stronger educational links, one area needing urgent attention is the visa hassle Bangladeshi academics face when attending conferences in India. While Modi is likely to announce visa on arrival for those who fly by air, visa issues that obstruct interaction between members of civil society and the business community need to be given high priority. Second, the role of India’s Northeast in India-Bangladesh ties has long been delinked from security and migrant issues. It is time that Northeast India and Bangladesh built not only strong economic links, but also greater cultural and educational ties. Apart from more border haats, something border states have already called for, the two sides should explore the possibility of sister city arrangements to promote more people-to-people interactions. 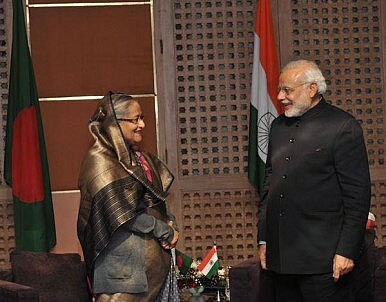 India and Bangladesh share much in common, beyond culture. They represent one of the most important relationships in South Asia and, for India, a vital element in its Act East Policy.